It takes a very special friend to drag me into my craft room to make a card these days since I no longer do a card ministry. Last Easter my hubby and I went to Milwaukee to visit old friends and meet up with our kids. It happened to be my friend's birthday just a few days earlier so I purchased a pot of pretty yellow tulips and I made this card to give to her when I saw her. 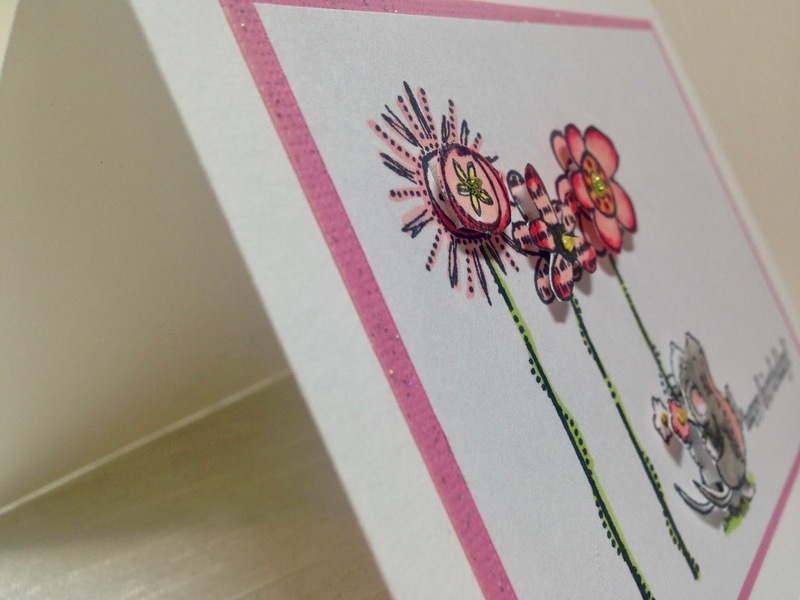 Because I don't have a lot of time to spend in my craft room in the spring I kept the card very simple. I used two different stamp sets on this card. The Penny Black mouse and sentiment are from one set and the florals are from another. I love it when I can mix and match stamp sets, don't you? 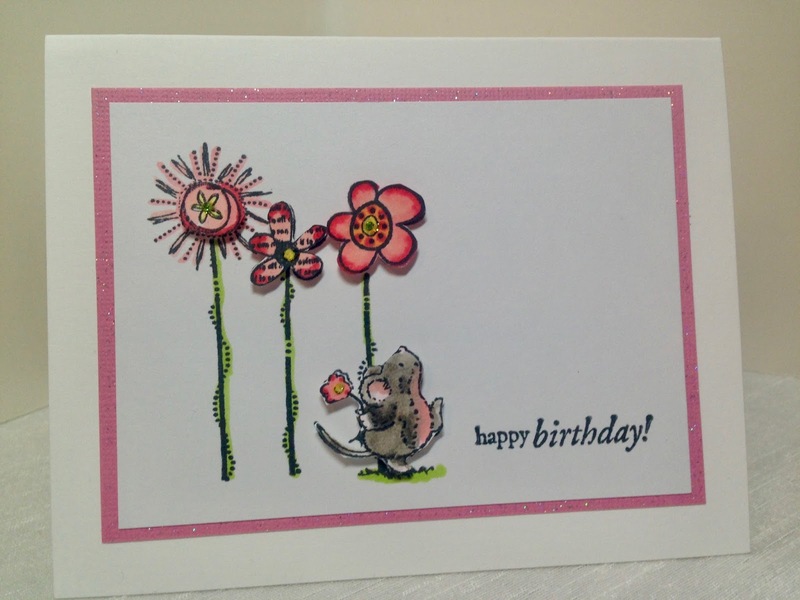 To add interest to my clean and simple card, I used dimensionals and popped up the flower heads and mouse. 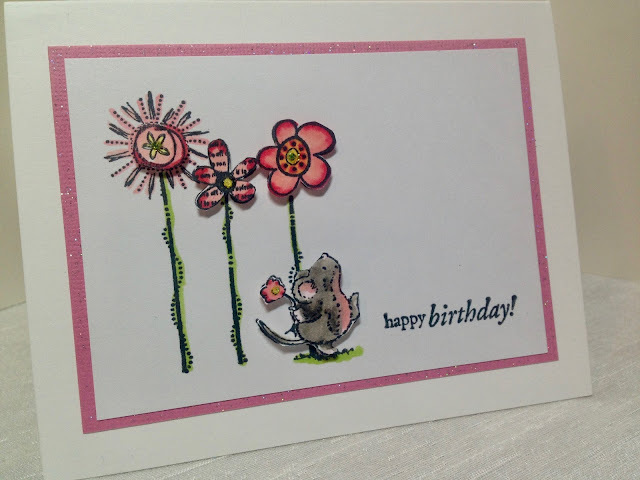 I also added sparkle with some Stickles in the flower centers, and by also using pink glitter paper to frame my main image. This pop up technique is done by stamping the image twice. Stamp once onto your main image panel. Then stamp again on a separate piece of card stock, color, cut out, and place over the same image on the main image panel. This is really cute! And love the sparkly paper you used as a mat for the image panel. It's hard for me too sometimes to get into the craft room, funny that I used to have more time before I became a stay at home mom/housewife! Now I have to sort of schedule which day of the week I will be making a card or two, it works that way for me and I am not quite ready to give it up. Thanks Elli! Even though I like making cards, I have other crafting projects (like quilting) I work on during the winter. And in the spring/summer/fall I have no time for crafting because of my garden. I also have been so busy the past two winter with home renovation projects that I haven't had much spare time to paper craft. I feel bad about that sometimes since I have such a large, gorgeous craft room that I'm not using that much...someday I'll get back to it. She must indeed be a special friend! 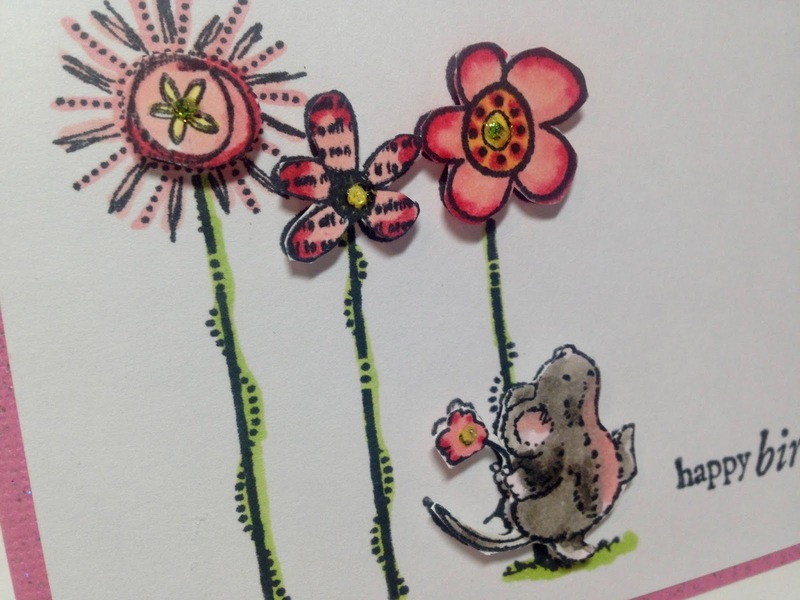 I can't imagine how much time you invest in one of these adorable cards. :) Love it! Thanks Carrie! Yes, she is!